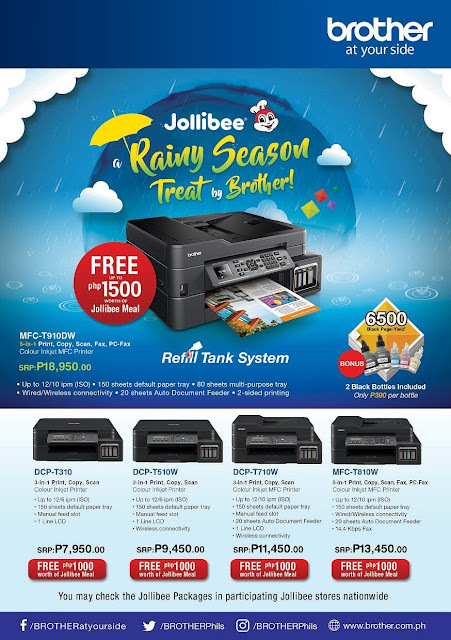 Home Brother Philippines Jollibee Printer Free Jollibee Meal worth 1500 when you join Brother Philippines' Rainy Season Treat Promo! Free Jollibee Meal worth 1500 when you join Brother Philippines' Rainy Season Treat Promo! Customers who qualify for the promo must log on topromotions.brother.com.ph and register to get a corresponding bCODE to their purchase. To redeem the meal packages, customers will need to present the email containing the code at any of the participating Jollibee stores nationwide under this promo, which runs until November 30, 2018.